Not to be outshone by our GDP colleagues, this post is to communicate the highlights from the GMP days at the 2015 MHRA Symposium. I’m Michelle Rowson, a GMDP Operations Manager, and part of my role is to lead in planning and preparing for the event; offering guidance to the speakers, reviewing and approving the presentations, and liaising with our events management team to make sure we have everything in place on the day for what we hope will be a professional and well received event. We started planning for the 2015 Symposium around February 2015, more or less straight after we had finished responding to questions posed by delegates who attended the December 2014 event. We identify agenda topics based on planned and future regulatory changes, emerging ‘hot topics’ that are or have the potential to cause compliance concerns, and from specific requests made by delegates in the post event evaluation forms. Once the topics are identified, then the next challenge is to identify volunteers to present! Although one of the objectives for the Inspector role is to provide guidance and authoritative information to stakeholders on inspection related matters, given the choice between inspecting or presenting, examining the workings of an air handling or purified water system can often seem less daunting than presenting to a full house of over 350 eager delegates! It was therefore good to see a number of a new faces taking to the stage at this year’s event. The GMP day started with an opening presentation by Richard Andrews (Unit Manager Inspectorate Operations GMP and PV), who provided an update on applicable Agency, International and Inspectorate activities. This was followed by a ‘What’s on the Horizon’ GMDP regulatory update by Martine Powell. The aim of the presentation was to help delegates keep up to date, give insight into the EU regulatory mindset, and have visibility of future changes, so that delegates could prepare and remain compliant with regulations as they evolve. 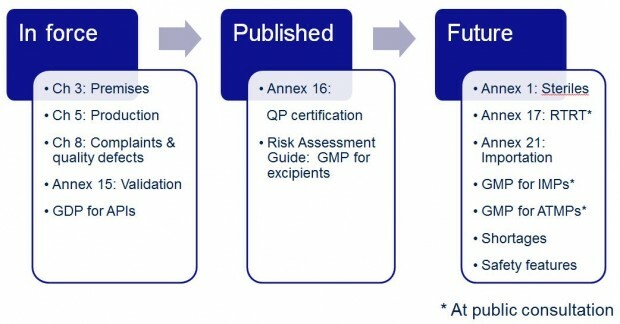 The take home message was summarised in the following diagram to highlight changes that had come into force, were published and future changes in the pipeline. Next up was an eagerly awaited update on Annex 16, which will become effective on 15th April 2016 after over 5 years in the revision process. The aim of the presentation was to provide an update on the key changes and what these mean in practise. To help put the changes into context, Trevor Watson, Tracy Moore and Chris Gray had designed an interactive role play of a mock inspection and incorporated example scenarios into the presentation. The next session on cross contamination and setting health based safety limits was included on the agenda to provide guidance on practical implementation following changes to Chapter 3 and 5 that came into force in March 2015. Chris Gray provided an overview of the permitted daily exposure (PDE) calculation and some excellent tips on how to source reference data correctly. Chris then handed over to Graeme McKilligan to outline the main routes of cross contamination and key considerations for performing risk assessments. The take home message was that organisational and technical controls measures must address the hazard to ensure risk is controlled. Ewan Norton ensured that no one was snoozing after lunch with his visually stimulating presentations covering API GDP and risk based excipient GMP. These topics were included on the agenda to raise awareness and provide practical advice on addressing the requirements which become effective on 21st September 2015 for GDP for APIs, and for risk assessment for GMP for excipients for human use which is required by 21st March 2016. The agenda then moved to the subject of Annex 1 for Sterile Medicines. Back in 2012, a proposal concept statement to the EMA’s Inspector Working Group proposing revision of the Annex and a subsequent request was made to PIC/S for support in updating. Andy Hopkins, who is leading for MHRA as the UK rapporteur, provided an update on the shared project between PIC/S and EMA and encouraged Industry to share their thoughts and any concerns. The presentation provided an overview of the proposed structure of the revised Annex which will hopefully be available for comment mid-2016. One agenda topic frequently requested by delegates is for information on common inspection deficiencies identified on inspection. Vivian Rowland rounded up the day by providing an overview of improvements in data deficiency trending. In 2013, we embarked on some work with stakeholders to review how we present our trend data and make sure that analysis and reporting continued to be of most benefit to Industry. Vivian reported on some of the agreed changes including reporting of low frequency-high impact as well as high frequency low impact issues, trending of all deficiency classifications, providing example deficiencies with contextual narrative, and compiling a data set which might facilitate inclusion of data from other regulators to provide a ‘big data’ view in the future. The event was drawn to a close by Richard Andrews who reminded delegates of the opportunity to speak directly and informally with Inspectors as part of the after-hours Inspector surgery. But, that’s not quite it for this year, as we are currently working on drafting responses to a number of questions that were submitted during the event. And just as the planning for this event began, we are already in discussion on dates, venues and topics for the 2016 event. So, hope to see you there but remember to book early! Hello, I was not participating in the Symposium and I am interested in receiving presentation from the Symposium - will it be possible? Thank you for enquiring about the possibility of receiving copies of the presentations from the GMDP symposium. The presentations are available for non-delegates to purchase. Please contact the MHRA Conferences team (conferences@mhra.gsi.gov.uk) to confirm which presentations you are interesting in receiving and they will be able to confirm the cost involve and provide instructions on how to obtain the presentations.